Learn just what the usual tuition is for U.S. undergrads throughout the nation, and how Bridgewater compares. Learn how the tuition and fees at Bridgewater College measure up to the average and see what you can do to properly get ready for probable tuition growth. How do Tuition & Fees at Bridgewater Compare With Other Colleges? For nationwide, regional and statewide comparisons, view the following table to find out how Bridgewater compares to other colleges. Full-time undergraduate students at Bridgewater College paid $33,820 in tuition and fees in the 2017 - 2018 school year, prior to modifications for financial aid. $33,000 was the price tag on tuition. $820 was the cost of fees. The tuition and fee charges cited on this page don't include room and board, which can increase your expenses. Keep in mind a lot of students obtain financial aid and scholarships that lower their total cost. 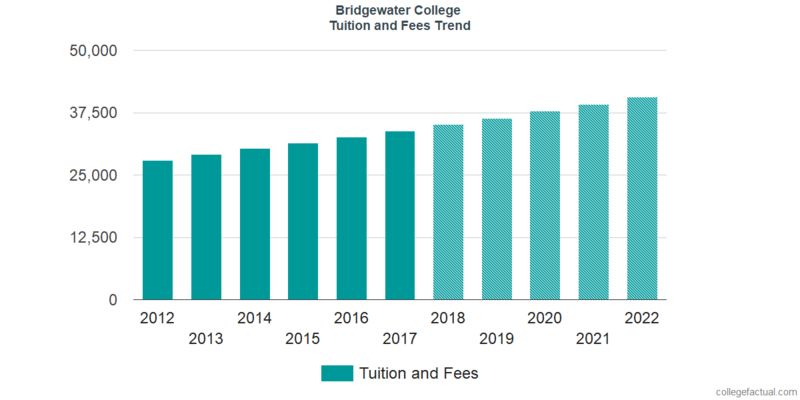 There continues to be a rise of 3.8% in Bridgewater College tuition and fees for out-of-state students in the past five years. Tuition grew by 3.5% and fees grew by 7.3%. This school year, undergrads can expect to pay $35,095 if the growth keeps up. Due to price growth, the total expense of a four-year degree from Bridgewater would be $148,520, and the total price of a two-year degree would be $71,513, which doesn't include added charges such as books, transportation, and room and board. Look at this next chart to find out how Bridgewater tuition and fees might develop in the years to come. Mainly due to the cost of living as well as other variables, the cost of college has a tendency to grow each year. For this reason your last year of school may very well be much more than your initial year.